John Simpson Knox was born in Glasgow on 28 September 1828 and joined the British Army at the age of 14. By the time of the Crimean War he was a sergeant in the Scots Fusilier Guards. He earned the Victoria Cross as result of his conspicuous gallantry in the face of the enemy at the Battle of the Alma. The following year he transferred into the 93rd Regiment of Foot and was present at the Siege of Sebastopol; he lost a part of his left arm when he was struck by a cannonball in the attack on the Redan. His Crimea Medal shows that he also fought at the Battle of Balaclava and the Battle of Inkerman. Despite the loss of his arm, he continued to serve, and was appointed an Instructor of Musketry on 7 January 1858, and promoted captain on 30 April. 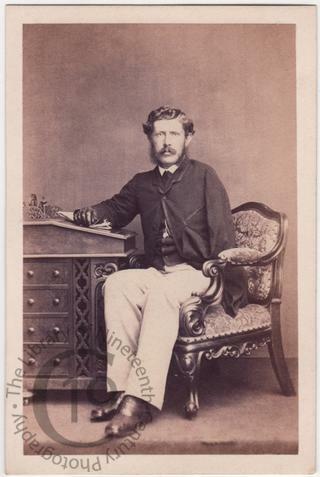 On 15 June 1866 he was appointed Inspector of Musketry for the South Western District. He retired from the army on 8 June 1872 and was granted a brevet majority. He took up residence at Cheltenham where he died on 8 January 1897. His VC was sold by Spink’s on 22 April 2010, together with the cannonball which had caused the loss of his arm. They sold for £252,000 ($387,500).